Cheesy Red Potatoes is the B-E-S-T side dish ever! 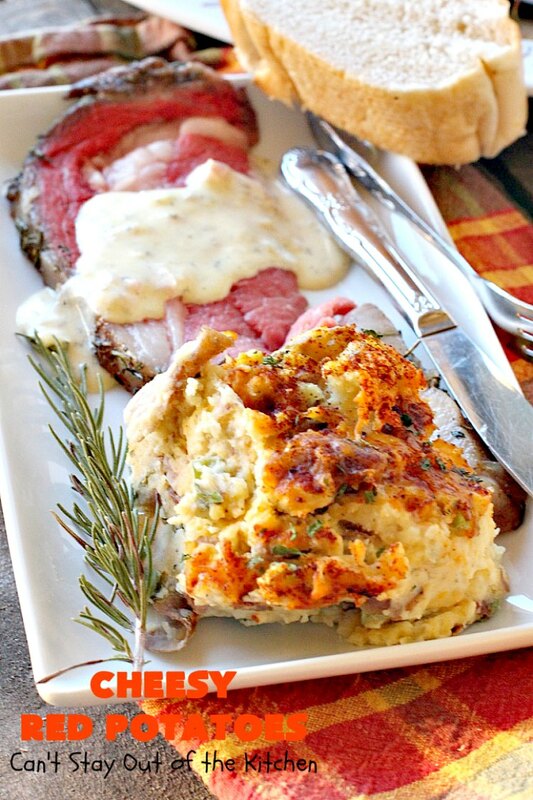 It’s terrific for beef recipes like Prime Rib Roast (which is what I served it with). But it’s also excellent to serve with chicken, pork or fish. 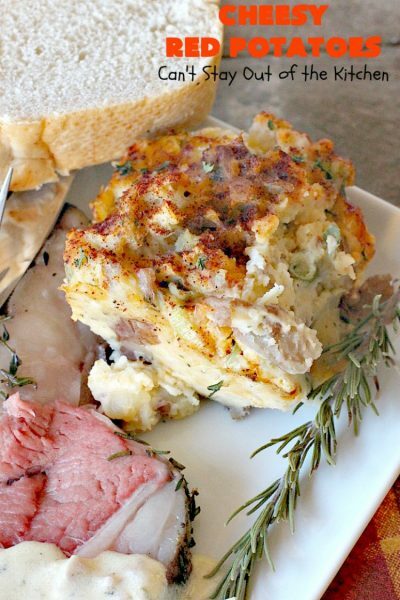 It’s mashed potatoes on steroids, uh, well not quite. But it sure is awesome. 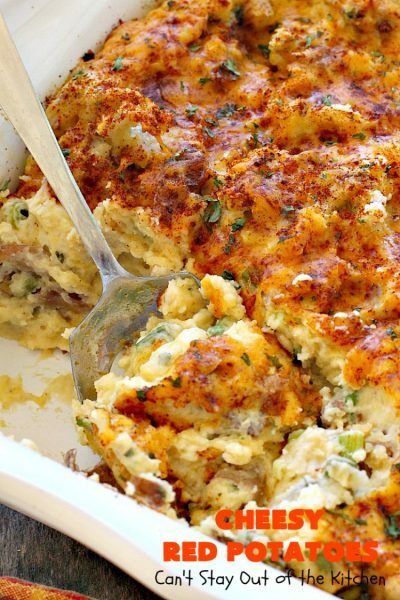 The potatoes are kicked up a notch with cheddar cheese, sour cream, green onions, parsley, paprika and garlic. They are so delicious. Back in November and again in December I cooked up a couple of Prime Rib Roasts. The first roast was served with Potatoes Romanoff and my Mom’s Old-Fashioned Green Beans. 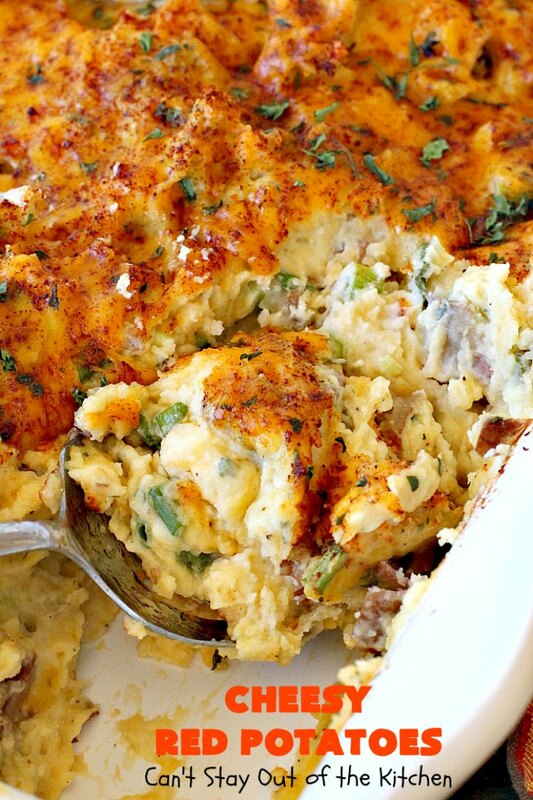 I served that for our Thanksgiving dinner with my oldest son and his girl friend. 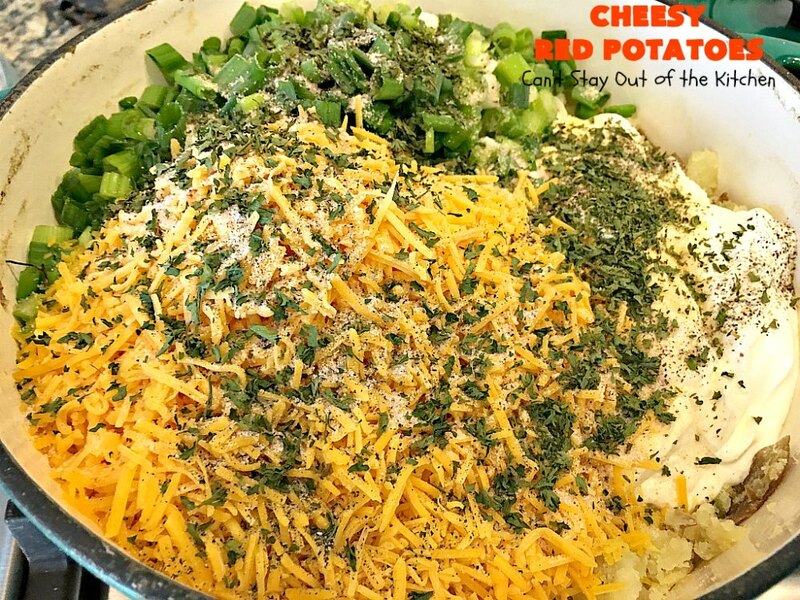 I made the second roast in December and served it with these Cheesy Red Potatoes. It was a much smaller roast that I served just for John and me. I love prime rib. But I also like to eat it with mouthwatering potatoes! 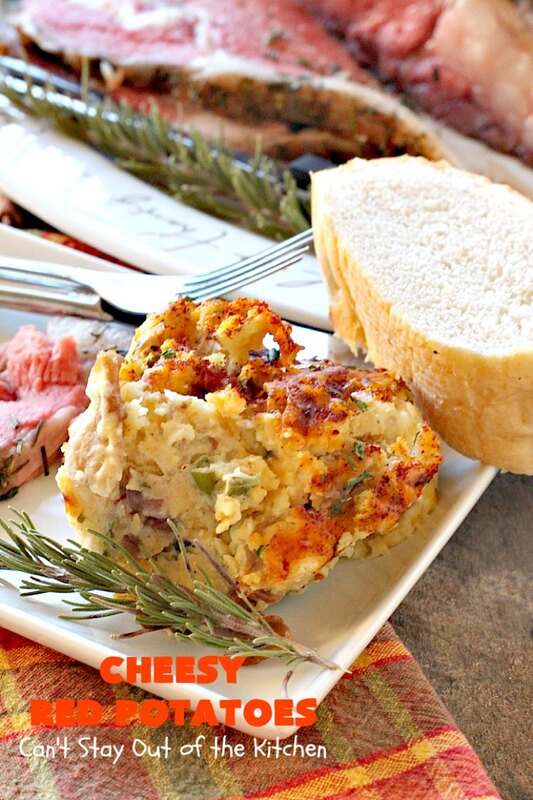 These Cheesy Red Potatoes fit the bill! I drooled over every bite. Cheesy Red Potatoes are awesome. 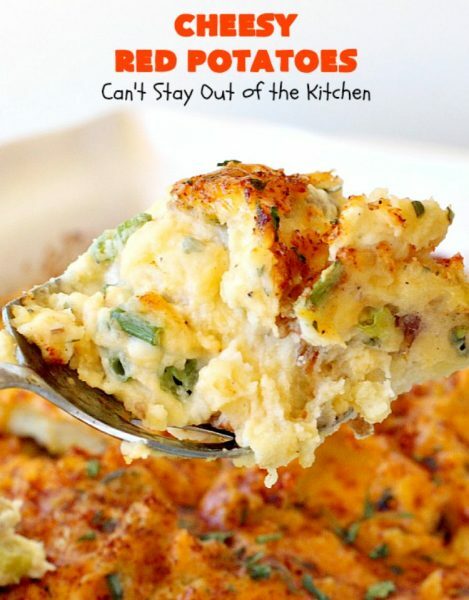 Potatoes never tasted as well as in this fabulous recipe! 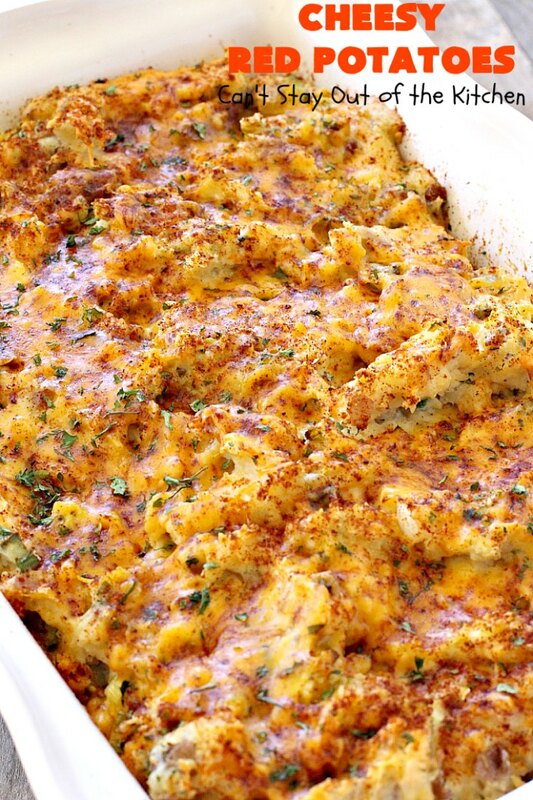 You can see this is a big 9×13″ baking dish of potatoes for only the two of us. 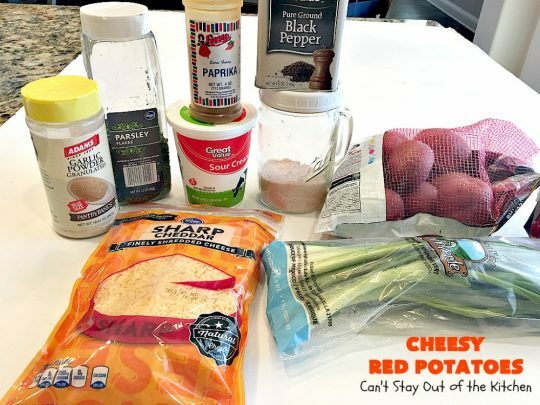 I ate these potatoes for lunches and snacks for several days afterward. Yum. I served Cheesy Red Potatoes with a Prime Rib Roast and Bearnaise Sauce. Wash red potatoes. Bring to a boil and cook until soft. Drain. 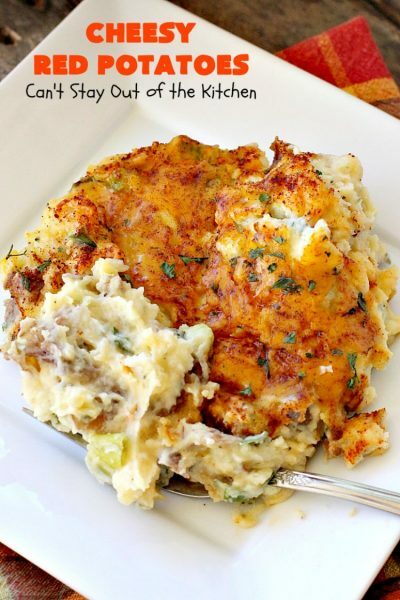 Mash potatoes with a potato masher. You’re not looking for a super smooth texture. 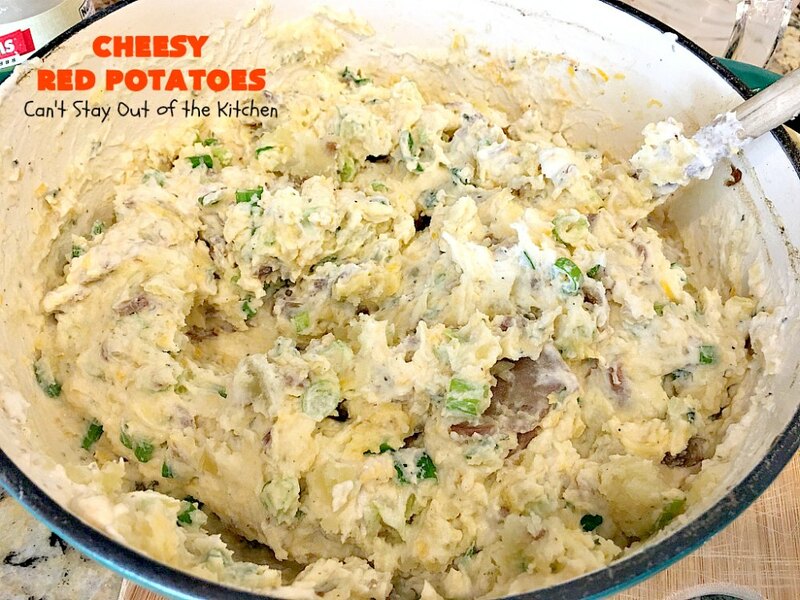 Leave some of the potatoes in larger chunks. 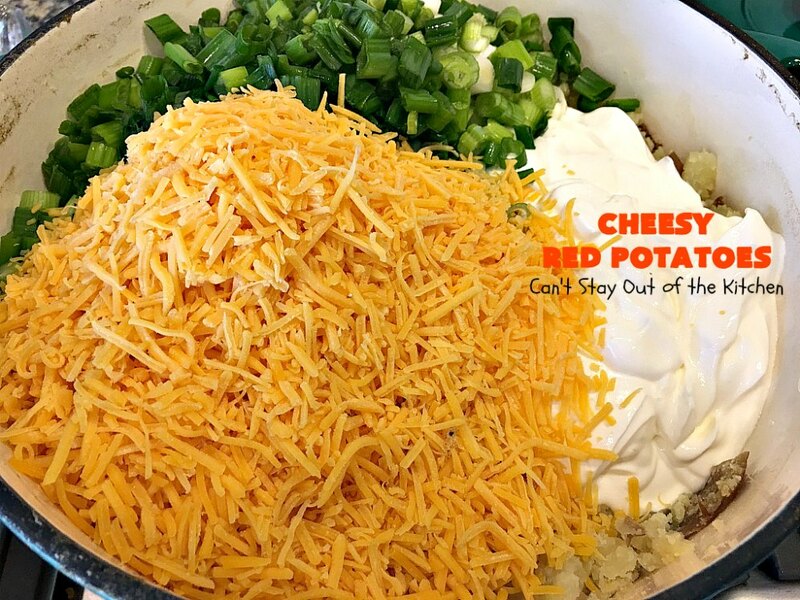 Add part of the cheddar cheese, sour cream and green onions. Add sea salt, pepper, garlic powder and parsley. 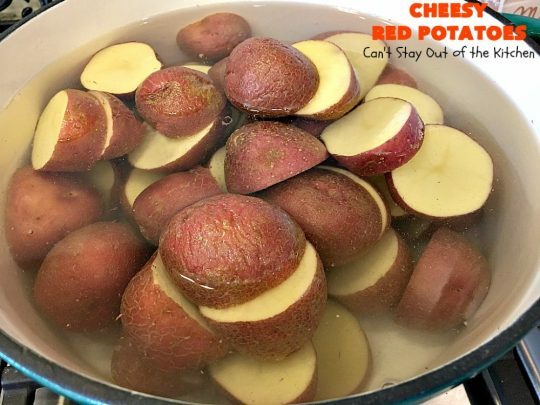 Spoon potatoes into a greased 9×13″ glass baking dish. Smooth top somewhat. Sprinkle generously with paprika and parsley, then add cheddar cheese on top. 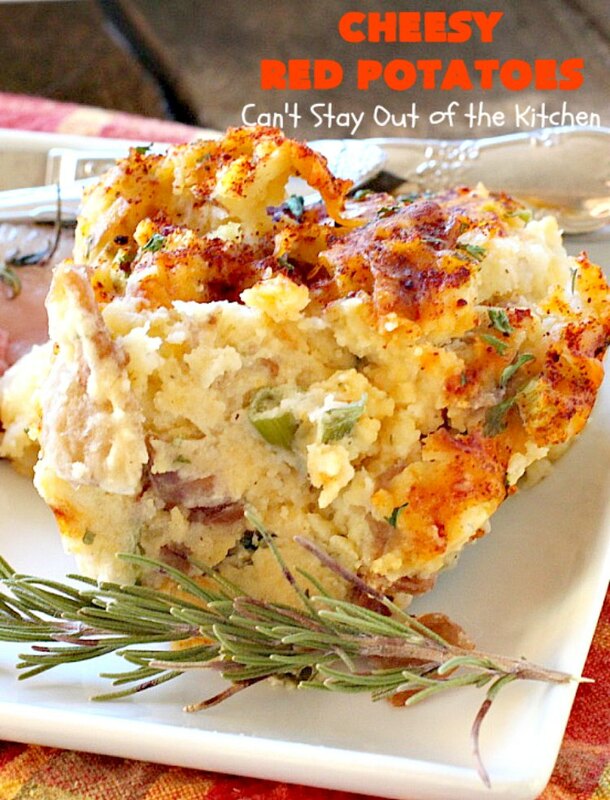 If desired, refrigerate casserole over night. OR you can bake immediately. Bake at 350 for 30-40 minutes or until heated through. These potatoes turned out so wonderfully. 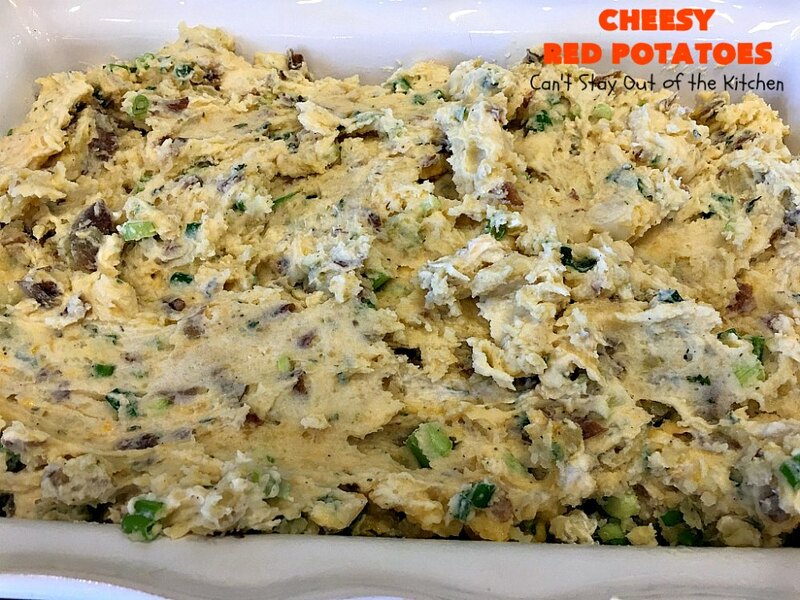 This is a really tasty gluten free recipe that your family will love. This is a terrific casserole for holidays. Cheesy Red Potatoes served with Prime Rib Roast are sumptuous and amazing. This amazing potatoes are perfect for holidays, company dinner or anytime your serving an elegant dinner. They're filled with sour cream, cheddar cheese, green onions and herbs that flavor the dish wonderfully. Gluten free. Mash lightly with potato masher. Stir in sour cream, onions, 2 cups of the cheese, parsley, garlic powder and the salt and pepper. Turn mixture into buttered 9x13” glass baking dish. Sprinkle generously with paprika and parsley. Bake uncovered at 350° for 30-40 minutes or until heated through. 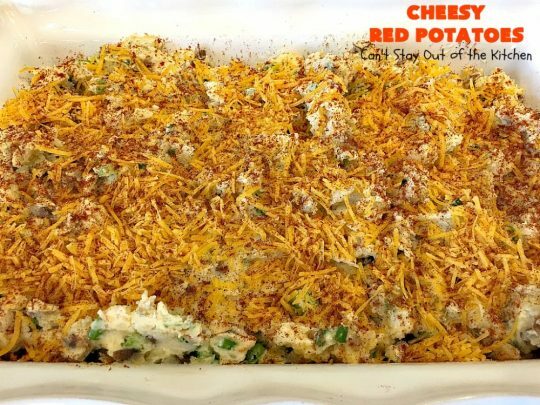 NOTE: You can also make this casserole by cooking immediately and without refrigerating the dish over night. 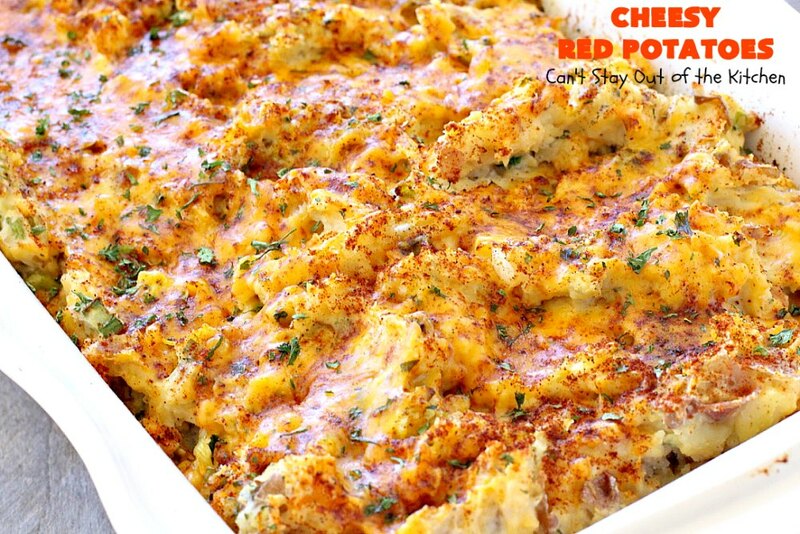 Cheesy Red Potatoes are smooth, creamy and absolutely pop with flavor. This side dish is perfect for beef, chicken, fish or pork. 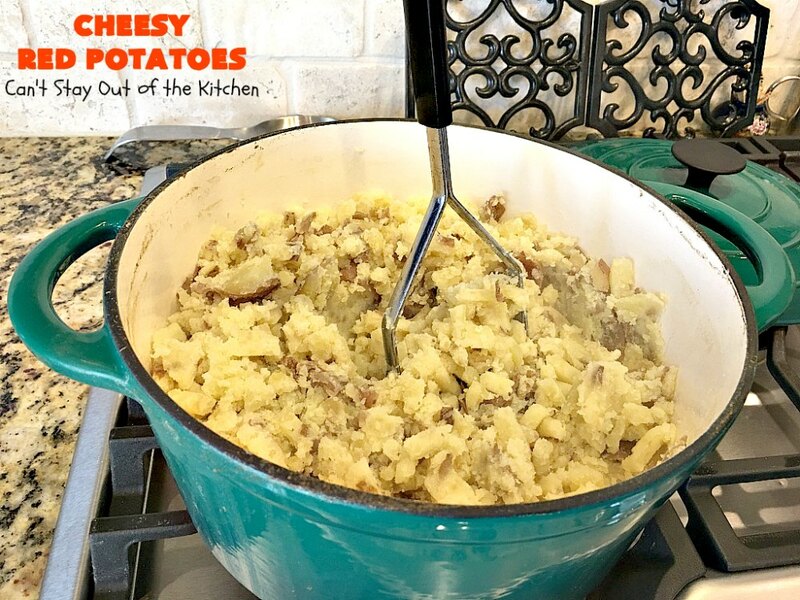 Cheesy Red Potatoes will have you salivating after the first bite!